I’m at the Decor + Design Show and waiting in line to hear Victoria Redshaw, international trend forecaster, speak and someone pushes in front of me. Actually quite a few people do. A group of people casually wedge next to the person in front of me, pretending like the stranger is their friend.They chuckle. Behind me, I hear angry speculations that come from the snaking line – well before and well after where I’m standing. “It’s a packed out event”, “Could they stop letting people in if it gets busy enough?” and “Maybe they’ve sold too many tickets!” are just some of the murmurings from those worried they won’t get a seat in the packed auditorium. There was literally a feeling of panic from some, that they wouldn’t get to hear Victoria speak. You’d think she was a Beatle, such was the sheer determination to get inside the seminar room and as close to the front as possible. Redshaw, the English guest speaker, may not have a record label or be a Youtube teen sensation with millions of subscribers, but to the crowd of designers, retailers and interior industry folk, she could have been, if crowd behaviour is anything to go by. Wearing gold jeans and with lovely long hair, Redshaw steps out and introduces herself. 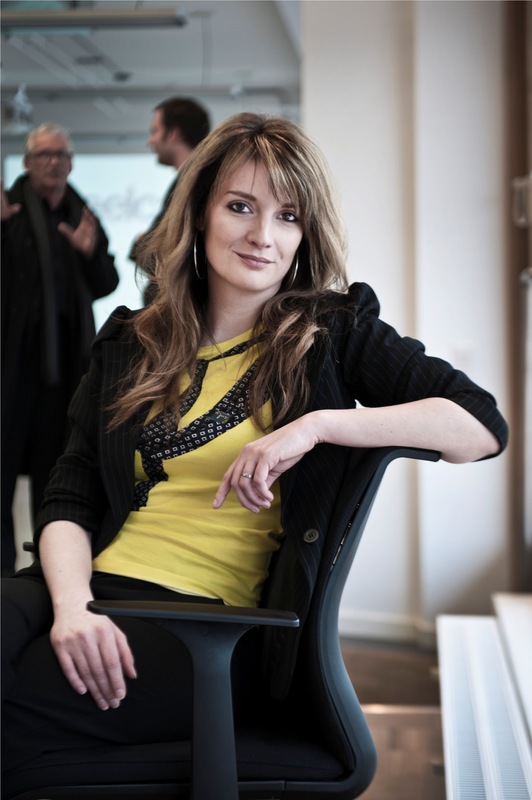 Victoria Redshaw, founder of the trend forecasting agency Scarlet Opus, based in Yorkshire, UK. Visitors to the one hour seminar got much bang for their buck, as Redshaw opens her mouth and began to speak and speak and speak about trends to come, trends current, trends past but more importantly, the why of it all. It’s the why that intrigued me, as I, like many, struggled to keep up with my note taking. And still intrigues me today. Why do trends occur? And what’s behind them? Who decides: Pantone, Anna Wintour or even an agency like Scarlet Opus? The latter is absolutely clear in its position: no. They’re in the business of researching, observing, studying, noting, comparing, evaluating: think of them as the well researched and intelligent messenger of the world of trends. They’re not the trend setters. Interestingly, we, the world, are the trend setters. Even if we don’t realise it. In her packed out seminar, Redshaw let us in on the process of how trends are identified and forecast, which she describes as “not as much cocktail drinking and partying as I was told.” It’s serious, analytical business – think computer, not crystal ball, gazing.The next time you see a trend in a fashion or homewares shop, just think of this: it’s happening for a reason. Or rather, it happened as a result of an existing worldwide climate and influence. Redshaw gave some insight into the actual process of trend forecasting, advising that factors like the previous seasons’ trends will help determine whether a trend is deepening, ceasing or staying put. The environment and world climate – told in news, current world events and even citizen journalism – also play a part in carving out a trend. “Everything from V8 summits to Justin Beiber: we need to know it and we need to know what people feel about it,” says Redshaw. Keeping abreast of significant future events on a global scale is also important too. “What we’re concerned in is what’s next, not now.” Victoria Redshaw, from Scarlet Opus, drew crowds when she spoke at this year’s Decor + Design show in Melbourne. This means considering the impact of art gallery openings, museum shows, environmental issues, economics, significant new hotels opening, architecture, commemorations, centennials, exec. According to Redshaw, such major world events can have an impact on our private worlds. Essentially, world events shapes our mood, which in turn shapes our trends. For instance, after 9-11 colours were somber. “Afterwards, we had a lot of grey coming through,” explains Redshaw. “Even the carpet at the Oscars that year was grey, not red.” Similarly, after the Global Financial Crisis and recession, there was an impact too – this time a yearning for the security of days when the world seemed a more stable place. “Everyone wanted a step back again” to “familiar” trends, tells Redshaw. That didn’t stick around too long, as intervention came in the way of neons forcing a brighter outlook. The 2010 colour of the year was turquoise and, even brighter, the hot pink shade of honeysuckle followed for 2011. Analysing unforeseen events and, essentially, learning to spot what’s next before it comes is all part of the science behind trend forecasting. “Part of our job as trend forecasters is to see what designers are inspired by before they are,” says Redshaw. For instances, art exhibitions happening the next couple of years “will be influential”, she says. One of these upcoming exhibitions involves the Victoria and Albert Museum in London with 16th to 18th century art on display. Another future event with significance for the trend spotters is next year’s upcoming World Expo in Milan. A good trendsetter is like a good anthropologist: they’re aware of the links and common connections of different sectors, fields and happening. Looking at science, sport and art – for just three examples – and spotting the links is part of how it happens. “It’s a bit like putting a jigsaw together.” The jigsaw players have the benefit of research to illuminate their findings. “We do genuinely research what’s going to be on in the next few years,” says Redshaw, citing the “way people live” as being of major concern to her agency. From major hotel openings in the Middle East to propositions to build indoor meadows, world events are carefully considered. “It’s serious work. It’s not crystal ball gazing, it’s logic.” Heads up, bottoms on seats, eyes on-screen. “There’s a huge amount of time spent online,” tells Redshaw. Nothing goes past this observant agency, and Redshaw admits they were one of the first to notice the beginnings of a new trend a few years ago – the phenomenon of the bearded hipsters. They took interest when urban dwelling males started to grow their beards again, they took interest. (As did likely wives and girlfriends!) And watched the trend permeate nearly every city of the world, already knowing that it would happen before it completely did. Yet the trend of even the bearded hipsters will – hopefully – not be steeped as immortal offerings of free-falling facial hair, with the trend forecaster concerning that the general “use by” date of a trend is generally three years. Great overview Anna. I was there too and like you totally in awe of the depth of research that goes into trend forecasting. Previously I thought it was all smoke and mirrors. It was a great seminar.